It sounds like the stuff of science fiction: an augmented reality program that can look through your skin and show doctors what's ailing you. But that's essentially the idea behind the new ProjectDR, which was developed by two graduates of the University of Alberta in Canada, reports CBC News. Thing is, it's not really looking through your skin; instead, ProjectDR uses medical images from sources such as CT scans and lines them up with the patient's physical body while the doctor looks at them. 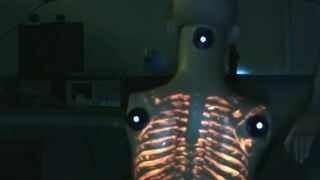 A little unfortunately, it doesn't use a device like the Microsoft HoloLens; instead, ProjectDR uses a projector to display the images on the body. But, it does come with many perks, such as allowing for specifics. If the doctor just wants to see a patient's lungs, that's possible. Tracking sensors on the patient's body allow the images to line up as intended, even while patients move around. It's cool, of course, but more importantly, developers Ian Watts and Michael Feist hope that doctors will find it useful for a range of options from surgical training to chiropractic care and physical therapy.